Published on 13 November 2012. Thanks to an on-call that was rather busier than I prefer, I forgot to post a photo last night. So, to make up for that, here’s one from this morning. 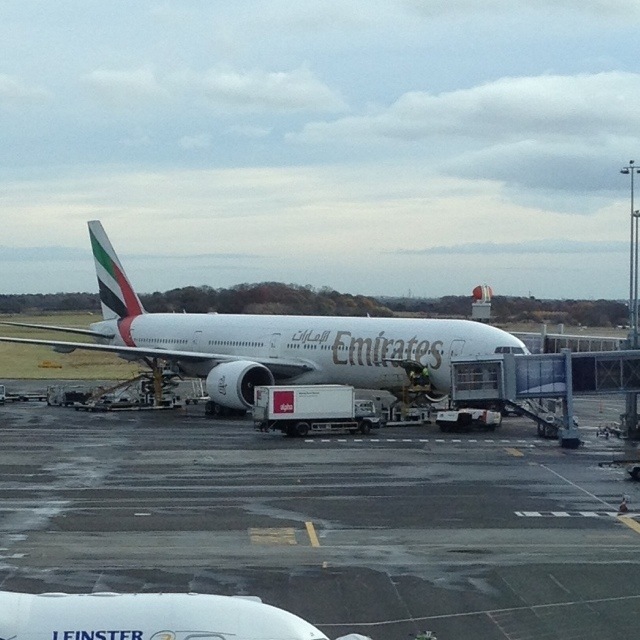 According to some plane geeks sat near me, this is the Emirates Boeing 777-300ER, the biggest aircraft to regularly service Newcastle airport. There was quite some fanfare when the 428-seater started running earlier in the year. In interviews, Emirates pilots describe Newcastle’s as one of the more “challenging” runways on the 777 route, thanks to its short length. To me, 2.3km sounds quite a long runway, but then I’m not trying to comfortably halt a quarter of a million kilos which hits the ground at 150mph, so perhaps I’m not fully appreciating the situation! This 1,887th post was filed under: Photo-a-day 2012, Newcastle Airport, Public Transport.